Define that beautiful back, one of the most overlooked parts during a workout. Trust us, people will notice! Back exercises and back muscles are often overlooked even though they’re so important in preventing back injury. Most people suffer from chronic back pain from sitting all day and doing simple back workouts can really help prevent damage and improve strength. This workout is designed to give you tone and definition in your back. You won’t get the hulk like bulk on your back, but instead a nice, sculpted chisel that will truly set you apart for the summer. If you’re a beginner or trying any of these exercises for the first time, be sure to go with lighter weight to fully master the movements. Use a spotter on movements like the lateral pulldown when going heavy. For the chin ups/pull ups you can use a stool to rest one of your legs while you build strength, or use the assisted pull up machine. This will help you master the movement and build strength. Overall this workout will give you energy, a better back, and that beautiful, sculpted tone for that tank top or bathing suit you love. Start by sitting at a lateral pulldown cable pulley. Keep your feet planted and adjust the knee holders (if available) to the correct height. Attach a wide bar to the pulley. Reach up and grip on the shorter angled portions on each side of the bar, with you palms facing forward. Lean back at a 25 – 35 degree angle with your chest sticking out. This will give your back a natural curve. Exhale while slowly pulling the bar down towards your chest. You should feel your back squeeze together at the bottom of the movement. Pause, then inhale while slowly letting the bar back up to the starting position. Tip: Be sure to not swing with your back to pull the bar downwards. Be sure to also keep your back stable through the movement. There are many variations to this exercise, however, we’ll go over two here. Start by picking an EZ bar with your desired amount of weight or by adding an EZ bar to a low pulley. With your feet shoulder width apart and your legs slightly bent. Hold the EZ bar or EZ bar pulley in your hands with your palms facing down and towards each other following the natural curve of the bar. You should be holding the bar close to your body with your arms extended downward. Exhale while pulling the bar vertically up. Your elbows should kick out to your sides. Pause for a moment at the top of the movement then inhale while slowly letting the bar back down. Repeat for the desired amount reps.
Start by attaching a single handle to the lower or mid to lower setting of the pulley. If you’re on a fixed seated row machine that has a place for your feet you can simply leave the pulley as is. If there is no seated pulley row machine, bring a seated bench about 2-3 feet from the cable machine. Sit with your feet planted against the feet pads or firmly planted. Hold the handle firmly in front of you with your arm extended, but relatively straight. Lean back slightly while keeping your torso straight. Pull the V bar towards your chest, while trying to keep your elbow close to your body. You should feel your back muscles contracting towards each other. Exhale through the movement. To begin, put a set of dumbbells, slightly wider than shoulder width apart. 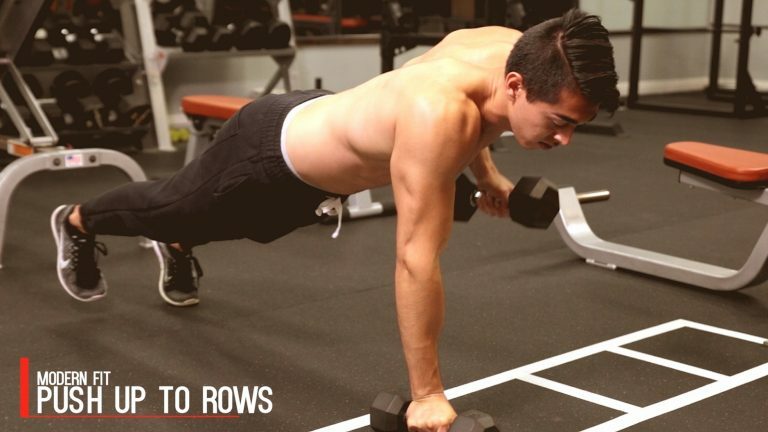 With your hands on the dumbbells, set yourself in a pushup position. Lower your body to the floor, pause, then complete 1 push up. Once you’re back in the starting position, row the dumbbell on one side to the side of your chest by pulling the dumbbell upwards. Pause at top, then lower the dumbbell back down. Repeat the same movement with the other arm. Before performing your exercise adjust the hyperextension bench so that your thighs lie flat across the upper pad and your ankles are right under the footpads. You want to make sure that you’re able to bend at your waist with no issues. With these positions in made and adjustments made, lie on the hyperextension bench. If you’d like to challenge yourself and feel comfortable, grab a weight and hold against your chest in front of you. If not, cross your arms against your chest or hold your arms behind your head. Keeping your back straight, bend forward slowly at the waist inhaling as you go. Go as for as you can without compromising your form (back straight) as to prevent injury. You’ll feel a stretch in your upper legs. Pause for a second at the bottom part of this motion before exhaling while slowly coming back up to your starting position to complete one repeat. Chin Ups are one of the best bodyweight workouts you can do. As you get better at them you can add weights to challenge yourself even further. To start approach the pull up bar. Grab the bar with your palms facing towards you, slightly closer than shoulder width apart. Breathe in while slowly letting yourself back down. You should really feel the movement in your biceps as you move up and down.